Allows running a higher water system pressure and higher boiling point. Worked great keeping my bike from spewing too much coolant out, would recommend over others I have tried. Worked as described, no issues. So far so good! I ride very technical hard Enduro terrain and my bike was steaming over a bit until I put this cap on I haven't steamed it yet thus far. Good price easy fix! I would recommend this if you are having steaming over problems when clutching the bike alot at low speeds. Not my first CV4 radiator cap so I knew it would do the trick. I ride in the hot Australian outback where its pretty much 100 degrees Fahrenheit every day. I ride in a MX track in a sandy river bed (dry most years). The original cap would release the coolant when/if the bike stops suddenly (fall/stall) or just stopping after a few laps on the track. To avoid this, I would have a light run on the side road to allow maximum ventilation and low effort for the engine to cool down - this happens no more with the CV4 as it holds the pressure higher than original caps! i ride a 2011 200 xcw in the mountains and this cap keeps it from blowing antifreeze out. I haven't really tested this cap out on a hard ride yet but it seems to keep coolant from coming out of the overflow tube when the bike get hot. This is the fastest and least expensive way to improve your cooling system effectiveness. I’m looking forward for the summer time to be able to judge even better the improved capabilities . 0.4bar extra is 25% more pressure in the system compared to the standard one. I tried it and loved it, it seem to be made of good quality material. Great product!! Fits good. Never had a issue with it. Have about 60 hours on it. Looking for a good cap look no further than this! I've owned several of the CV4 high pressure caps in the past and they have all worked great. If you're cooling system is on the edge of boiling and steaming in tight technical spots this cap will usually take care of the problem by raising the system pressure. I ride in high temps through rock gardens and occasionally slog through deep sand and silt and these caps are mandatory. They can get you home without boil overs and runs dry even without radiator fans and coolant catch cans in the worst high heat conditions. The very best thing you can do right up front to heat proof your bike. I was having some overheating issues with my 12 350. The fix was as simple as installing. If your overheating, try this first! I noticed my cooling fan coming on frequently with the stock radiator cap. After I swapped out the stock cap with the CV4 Radiator Cap, I noticed the fan does not come on unless it's really hot (+90 Degrees), I'm climbing, and moving slowly. No boiling over, and coolant level stays full. This is a must to keep your machine running cool. Heat kills your power and wears on the moving parts. I didn't have a problem with stock either but have an extra. Seems to work just fine I haven't over heated the KLR and have not lost a drop of coolant in 1,800 miles even in a 2 hour traffic jam stop and go. Fit perfectly, did the job i was happy with the outcome. My bike overheated because i didnt have one. It's 100% doing what it is supposed to do. That means 100% satisfaction. When ever any of my customers have over heating issues I always recommend this cap and have great success. I am reviewing this product for high altitude riding and very technical riding. Works well. Easy to install. Does what it's supposed to do. A little expensive for what it is. Does what its suppose to. Even looks good. Bought it because stock one would open too early. , originally thought i was overheating the bike. Replaced the stock 1.8 bar with the CV4 2.0 to top boiling over on tight trails. Works great and the radiator cap fit my KTM perfectly, great product. Boiled over in the woods and trail blazing thru tall grass. I changed to ice anti-freeze which helped, but this new cap made a big difference. My bike is known to run hot, but problem solved !! It's hard to tell how effective this part is because I also upgraded the water pump impeller and I did this early on to avoid boil overs. I'm guessing that the combination of both parts helped, as well as the samco T-stat bypass hoses. Now and then on hard hill climbs where I'm struggling the bike will steam but I've never had to add more than what would amount to a mouthful of water to it. I do not have a fan on my bike and would like to avoid that. Put this on a the same time I installed the Thermobob kit. I installed this cap to help the performance of the kit at higher altitudes and it does wok wonders. Great product. Helps prevent coolant loss and raises the boiling point of the coolant. Between this and Engine Ice my boil over issue was fixed. Big improvement over the stock radiator cap. Before i had multiple boil overs, now there's one less thing i need to worry about on the track and trails. I had a problem with my bike boiling over in the summer months at the track. I would lose 1/4 of the coolant minimum during my moto.. The CV4 cap fit just like stock and resolved the problem. No more coolant loss! Well worth the money. I installed the high pressure cap, and have never had an issue with overflow since ! This cap cured the boil-overs I was having while going slow in tight trails. No issues on the track either. Was overheating during extreme conditions during hare scrambles. The little extra pressure provided by cap solved issues. had some overheating on some slower paced races because of mud but raising cap pressure seems to have helped ,so far good move no more overheating problems. 450's tend to run hot, especially on trails. 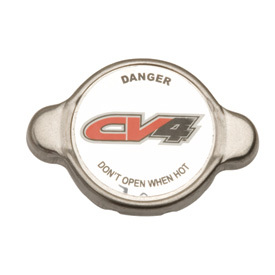 The CV4 cap is cheap protection against a boil over. Highly recommend. You can get the best product at a great price !!! Part fit and function were just as expected. bought the highest pressure cap I could to keep from boiling over. I ride 115 degree summers on tight trails and haven't had an issue since I installed this cap. I know it doesn't lower operating temps at all but at least im not losing coolant making my situation worse. I had problems with my bike boiling over after long motos but as soon as I put the cv4 cap on, the problem disappeared. BUYER TAKE NOTE: make sure you know what the pressure range is for your cooling system. If you raise the pressure too high, you could damage every downstream component (water pump, thermostat, hoses, etc.). The 2014-15 Honda Rancher is rate between 15-20 PSI (1.1 - 1.4 bar). Going any higher is dangerous and could void your warranty if you blow the cooling system due to high pressures. I bought the 1.4 bar CV4 cap because that's still within the pressure range for my ATV (20 PSI). Couple this cap with Engine Ice coolant, and my ATV never goes above 2 bars on the temperature gauge. None of this makes the engine run colder - that's dangerous - but it does enable it to run at the optimal temperature consistently across various types of riding. I ride on trails that don't allow high speeds, so the radiator fan used to come on all the time and the temperature would spike. Now, it runs very efficiently. Well worth the small cost. Make sure you do your research before putting a high pressure cap on your ATV. Higher pressure isn't always better, even if it does prevent "boil over." This cap keeps the coolant where it belongs - so much so that I removed the overflow bottle from my WR. Even in the heat of summer with some slow-speed trail sections, it doesn't lose any coolant. If you go this route, just be aware that it puts greater pressure on the rest of your cooling system seals and components. No issue for a healthy system. It does what it is intended to do. It raises the boiling point of coolant. The only complaint is that it is a real pain to turn to remove. It is on very tight. I usually put on a pair of mechanics gloves to get enough grip to turn the cap. This worked well to slow the puking coolant issues I had. Combined with Engine Ice it worked even better. Very good quality cap, that seems to have helped my gnarly trail riding boil over problem. Thumbs up! Is a 1.4 bar radiator cap to much pressure for a 09 kx250f? BEST ANSWER: No. I run a 2.1 on my 450 that I use in Florida/Georgia for 2-hr hare scrambles and 4-5 hour ensuros. The key to using a higher pressure cap is ensuring that you use the recomended coolant type in the system and not aftermarket "super" coolant without the proper lubricant additives to condition the seals. I have fellow riders on 250's using the 1.8 bar caps with much success. I hope this helps. Should be fine. I used this cv4 cap on a ktm520sx. On my ‘05&’06 kx250f I used the Tusk hi pressure cap with temp gauge which was 1.8 bar and was fine. No......1.4 will be fine. You can go with a higher pressure as well. Worked great on my 2012. Why do I need this mule part? BEST ANSWER: This high pressure radiator cap raises the boiling point of the coolant in your machine. Therefore, you can run it harder and longer with less risk of boiling it over. 50/50 ratio of coolant has a boiling point of 223 degrees. Straight water has a boiling point of 212 degrees. Both however are boosted significantly by the pressure in the system. A standard 1.1 bar cap adds 48 degrees to the boiling point of either fluid. So the coolant in your car will not actually boil until ~260 degrees, or ~271 degrees if it has antifreeze mixed in. Adding the additional 0.2 bar of pressure gives us another 8.7 degrees in both cases.By upping our cooling system pressure to 1.3 bar we gain about 8.7 degrees. Antifreeze only adds 11 degrees to our boiling point, so the main reason for running a 1.3 bar cap is to run straight distilled water (with water wetter to prevent corrosion) or a significantly reduced antifreeze ratio without danger of boiling over. Specifically, in the summer months.So why not run it this way all the time? Well, let's not forget the freezing point. While the pressure cap trick gives us a higher boiling point, it does not a thing for freezing point. If your area doesn't get down to negative temperatures in the winter, you can run a decreased ratio of antifreeze to coolant if you like all year round. However, I'd still run 50/50 in the winter. The good news is, in the winter, there's less need for excellent cooling as air intake temps and ambient temps help you out a lot more than in the summer. It is listed for a KLR 650 too. The KAWASAKI manual lists the design max spec. for that radiator at 1.2.